Dolly Parton stands larger than life in American pop culture. While Cliff and I are enjoying time away to celebrate our 50th wedding anniversary, Dolly has agreed to entertain you. “When Dolly and Carl eloped across the state line to Georgia, the only witness at their wedding was her mother, Avie Lee. After, we drove home and went back to work as usual,” Dolly recalls. Of her husband Carl, Dolly admits . . . They got married again when they renewed their wedding vows in May 2016. “As long as you live, there is always some new twist on the same old thing. I always try to find it” in my songs, says Dolly, on tour in June 2016. Listen for the words . . . Forever is the love that is true, undemanding. Forever is the love that can STAND the test of time. In case you missed it: Our own wedding was not a lavish affair, but we shared it with family, relatives, and friends. You can read about it here. Whose relationship you admire has stood the test of time? It may be someone else’s. But it may be your own. Here’s where to tell all about it. Anyone who makes their marriage last that long has my complete respect and admiration, as well as my congratulations. It seems to me that staying together in this day and age seems harder and harder. We were lucky enough to celebrate my in-laws 50th Wedding Anniversary 6 years ago and we are all looking forward to their 60th already. Thank you for starting off the conversation here from your caravan, Fatima. If photos of you and your mate on Facebook are any indication, travel helps a marriage flourish. Fifty years is far more common now as life spans lengthen. Congrats to your in-laws’ Golden accomplishment too. Paul Newman and Joanne Woodward’s marriage always impressed me. And of course my parents who almost made it to 60 years!! Your parents must have been a great role model. I met a couple in our church recently who seemed happy together at 72 years. Well, your relationship with Cliff has definitely stood the test of time! Happy Anniversary again! I can’t wait to hear more about your trip. For the first time, we booked our lodging in British Columbia through AirB&B and met some pretty interesting (and unusual) hosts. Best of all, we escaped Florida heat for almost two weeks. Back home, we are resting up from navigating Vancouver traffic and coping with a 3-hour time change. Highlight: Hiking in forests of Douglas fir and cedars. Thanks for the prompt, Merril. Dolly (Yes, my wife’s nickname is Dolly) and I have been together 54+ years this past November and our marriage is similar to Dolly and Carl’s. My wife is more of the free spirit gypsy type always up for a challenge and new adventure while I prefer the quiet life at home but apparently we are making it work as we are still together and still tackling new adventures each and every day. Thanks for sharing. Oops – made a mistake – 54+ years this past May – May 18 to be exact – don’t know where my mind went when I typed November. 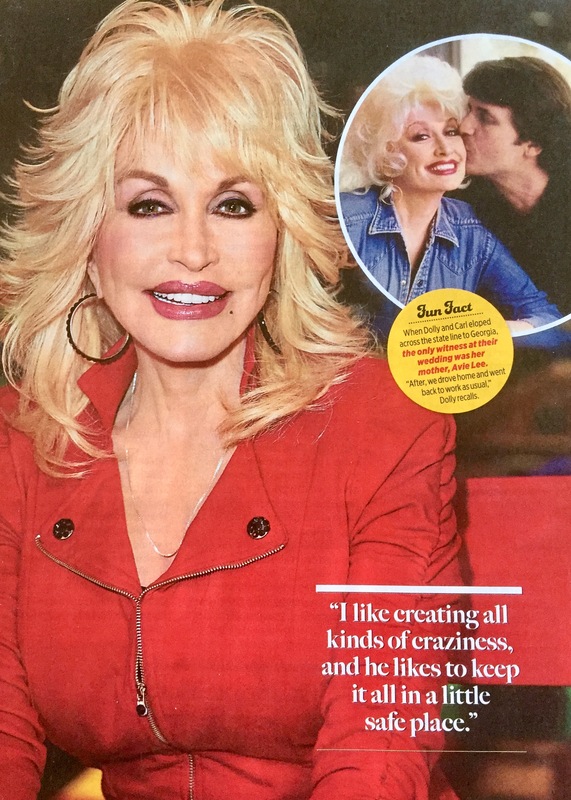 Congratulations to you and Dolly – a happy synchronicity here – on your 54 + years together. You obviously have your wits about you to acknowledge the exact date. I admire your “still tackling new adventures each and every day,” our hope for the future as well. Thanks for reading and commenting once again! My pleasure. I enjoyed the post very much. I’m listening now with my Amazon Prime music app. I like the words. They describe what Stuart and I have experienced as we head to 50. Two more years to go. Congrats to you and Cliff. You chose a lovely, lovely place to celebrate. We too will go to Canada — but to the other side of the country, Nova Scotia. May your 50th year together be the best ever. Thank you, Shirley, for the comment and good wishes. I’m hardly a guide to pop culture but I do keep my eyes open when I pass the tabloids at the check-out counter. You may know Cliff is a Westerner and has sacrificed proximity to his family so we could stay on the East Coast. Thus, we try to plan vacations in his part of the country; he misses the big skies and tall trees. Incidentally, I admire what you and Stuart are doing as you head toward 50. Taking care of a wee one requires a huge investment in time and energy but so rewarding for all generations. Your imprint will forever influence little Lydia Ann. I admire Jimmy and Rosalynn Carter’s marriage. And congratulations to you and Len as you approach 38 years, Laurie! Hello Marian; your post and everyones’ comments engross me as I am also in a long term partnership. However Dave’s and my 36 years seem like nothing compared to many here. I have to say, as much as I admire the marriage stories of Clintons and Carters, I also love the partnership of my own parents, Mary and Cecil, whose marriage lasted from 1941-2004 when death did them part. Sorry, you can’t google them…. Congratulations on your and Dave’s 36 years together, nothing to sneeze at. And thank you for mentioning the partnership of your parents, 63 years if my calculations are correct. (Happy not to Google anyone here.) All memorable, by any measure. Thanks, Dolores. 41 years here and counting…………. Congratulations on your mounting years. “And counting,” a good sign. Thank you, Jack. lovely post and song, Marian. Successful marriages are so worth the work it takes to stay on track with each other. Like you I’m one of the lucky women with a great man. For some reason, maybe because you are moving soon, I thought of marriage as never static – always moving through time and place. A great partner makes the journey even more worthwhile. Today was the day exactly one year ago we moved to our one-story home in the Spindletree neighborhood. We are so thankful, and you will be too when you land in your “forever” home. Thanks for checking in here, Joan. Dolly has a strong Christian faith which undergirds her life in the limelight. Many think she is shallow because of her tawdry appearance. Once or twice she has said with a chuckle, “It takes a lot of money to look this cheap!” And I can’t understand how her waistline has stayed so tiny at her age. Liposuction? Tight girdle? Thanks for checking in during these busy, busy days. I hope you ‘re enjoying your celebrations my darling . I adore Dolly Parton don’t you , not just for her music but her heart . Congrats to her and her husband too. Awww – what a sweet story. I know you are super busy, so thanks for reading and leaving a comment here. Your photos are awesome as always, m’lady! What a surprise to see Dolly Parton on your blog. I clap for anyone who has a strong marriage in the show biz world–or in any world. Congratulations to you and Cliff. I like to surprise readers. Dolly has admitted to a strong faith and she has a good man who lets her do her thing – all over the world! It was a good surprise with laughter. I always liked Dolly Parton and how out there she dared to be along with a tender heart. I’m sure she gained strength from that good man supporting her from home and from her faith.